"We're going to be safe here, nice and warm." Warner Bros has debuted one final, official trailer for their animated movie Smallfoot, arriving in theaters this fall. The story follows a "bright, young" Yeti whose life changes when he discovers something that shouldn't exist—a human. This discovery throws the simple Yeti community into an uproar over what else might be out there in the big world beyond their own snowy village, in a story about friendship, courage and the joy of discovery. Channing Tatum stars as the voice of Migo; the cast includes Zendaya, Gina Rodriguez, Danny DeVito, Yara Shahidi, Jimmy Tatro, Ely Henry, and LeBron James. This seems like a fun movie, but the story looks similar to every other story about overcoming differences & learning to be friends (e.g. How to Train Your Dragon). Still might be good. You can still watch the first teaser trailer for Karey Kirkpatrick's Smallfoot here, or the second trailer here. 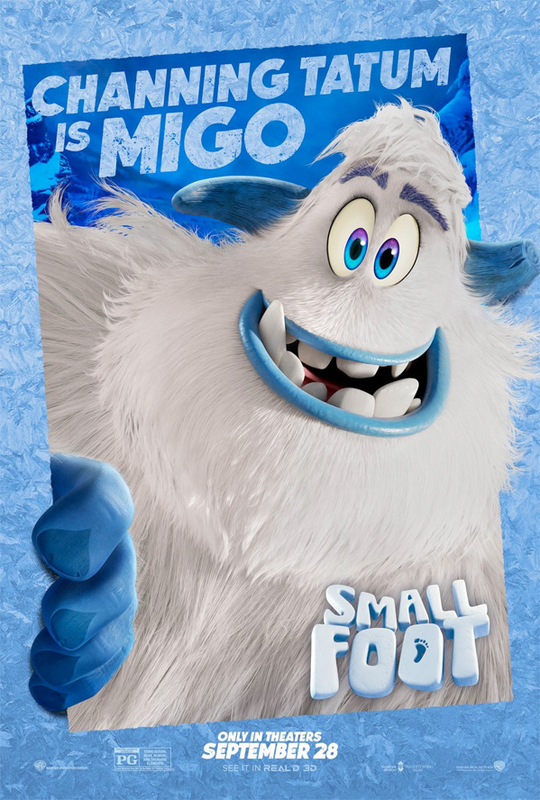 An animated adventure for all ages, with original music and an all-star cast, Smallfoot turns the Bigfoot legend upside down when a bright young Yeti finds something he thought didn't exist—a human. News of this "smallfoot" brings him fame and a chance with the girl of his dreams. It also throws the simple Yeti community into an uproar over what else might be out there in the big world beyond their snowy village, in a rollicking story about friendship, courage and the joy of discovery. Smallfoot is directed by filmmaker Karey Kirkpatrick (of Over the Hedge and Imagine That previously) for Warners Animation Group; co-directed by Jason Reisig. The screenplay is written by Karey Kirkpatrick and Sergio Pablos, as well as Glenn Ficarra & John Requa; based on a story by Sergio Pablos. Warner Bros will release Kirkpatrick's Smallfoot in theaters everywhere starting on September 28th coming up this fall. Who's planning to see this movie?